Spain is known for its ‘encierro’ or the running of the bulls and La Tomatina tomato festival. However Spaniards are foremost in sending flowers keeping in mind their relationships and traditions. Children’s are felicitated on January 6th for Epiphany than again on 25th December Christmas Eve. While gifting flowers avoid Dahlias or Chrysanthemums. Usually flowers are gifted in odd numbers in Spain. Send flowers same day to Spain using our local florists & flower shops. Order by 12 noon. Send Easter Flower Arrangement, Easter Hampers & Gift Baskets to Spain. Send Roses, Carnations, Lilies throughout Spain for occasions like Birthdays, Anniversaries, Funerals, etc. Enjoy affordable flower delivery across Barcelona, Madrid, Seville, Valencia & nationwide delivery. 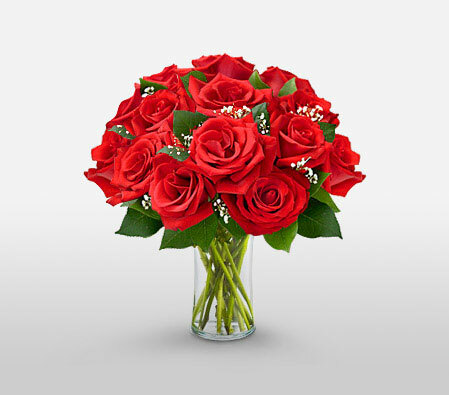 An alluring composition of style and luxury highlighting a natural beauty is presented through this extravagant collection of a dozen red roses arranged delicately with green fillers in a glass vase that will fill your loved ones day with passionate allure. How do i send International Flower Delivery to Spain? Flora2000 has transformed International flower delivery to Spain into a fine and effortless art. With our efficient flowers & gifs delivery services worldwide; you are sure to find the perfect expression of your message to your loved ones. Be it Roses, Lilies, Carnations or Cakes, our gifts are sure to make both the sender and the receiver happy. We make sure the gifts you give reflects what you feel about the receiver. National Day of Spain (Fiesta Nacional de España) is on 12 October, the anniversary of the Discovery of America and commemorate Our Lady of the Pillar feast, patroness of Aragon and throughout Spain. Spain is known for its ‘encierro’ or the running of the bulls and La Tomatina tomato festival. Spanish are a very open minded and communicative people; they give high importance to their families, relationships and traditions. Traditionally, children’s are felicitated by gifts on January 6th for Epiphany than on Christmas. While giving flowers avoid dahlias, chrysanthemums, white lilies or red roses due to cultural associations. Always present flowers in odd numbers. We have an exclusive collection of flower arrangements, hampers & baskets for this Easter. Our classy collection of flowers & Gifts for Easter to Spain.